The British Council, which secured a government indemnity for works from the United Kingdom and the US and gave considerable financial support for the organization of the exhibition, became the Tretyakov Gallery's main partner. The international participants of the project include major museums in London, Glasgow, Edinburgh and Liverpool, as well as the United States. Professor Margaret MacDonald, a world expert on Whistler, was selected by the British Council as the British co-curator of the project. Russia's Federal Agency for Culture and Cinematography allocated funds to cover in-country exhibition expenses and for the publication of an exhibition catalogue in Russian and English. Working on the project proved fascinating. The subject of Whistler and Russia had not been explored previously and the curators were like pioneers facing new and unexplored horizons. There were unexpected difficulties, too. For instance, Whistler's most famous masterpieces from the Freer Gallery (Washington) and the Frick Collection (New York) are not allowed to leave the museums because of provisions in the wills of the pictures' last owners. In addition, because Whistler is very much in demand, the museum lending schedule of his works is booked years ahead. Whistler's art has a rich exhibition history, ranging from major projects to shows focused on specific aspects of his life and heritage as an artist, man of letters and designer In recent decades, one of the most significant and comprehensive solo shows of Whistler's art took place in 1994 in London, Paris and Washington. In 2003-2004 American experts organized in Atlanta and Detroit the show "After Whistler: The Artist and His Influence on American Painting”. The 2004-2005 exhibition "Turner-Whistler-Monet” was among the most popular: travelling from Toronto to Paris and London, it drew large crowds in every city, and in London alone viewers numbered 380,000. In February 2006 the National Gallery in London opened an exhibition of the life and art of American artists in Paris in the second half of the 19th century. James McNeill Whistler was a key artist in this particular show. Japan is another country where the interest in Whistler's art is growing. Whistler held Japanese art in high esteem, starting a fashion for Japanese etchings and Oriental porcelain through his own collection of such pieces, and creating refined and delicate works in Japanese style. "Whistler and Russia” adds a new chapter to the international study of this artist. The exhibition highlights the complex dialogue that Whistler conducted with Russia's rich cultural traditions. This dialogue began in Whistler's youth, which he spent in St. Petersburg, and continued later when Whistler, already a mature artist, "peregrinated” between London and Paris but continued to reflect the artistic impressions Russia made upon him. Thanks are due to the British Council and to our British and American colleagues in museums in the UK and the USA, and also to Viscount Cowdray, who graciously agreed to lend a work in his possession - "Arrangement in Black, No. 2: Portrait of Mrs. Louis Huth” (1872-1874). Especially noteworthy are the contributions from Russian museums. The Pushkin Museum of Fine Arts lent etchings from the "French set”, exhibits unique because they had been kept in the museum in Moscow in the form of an album, stitched as far back as the 19th century, apparently in France. Recently the album was unstitched for the restoration and the superb etchings are shown to the viewer as separate sheets in the original sequence similar to that in the album. Four pieces out of the seven are shown and printed for the first time. The exhibition's Russian section could not have materialized as conceived by the organizers, had it not been for the input from the State Hermitage, Russian Museum and regional art collections that provided additional highlights around the show's subject. A private collector in Moscow, and the Central Museum of Railway History lent rare items linked to the story of the arrival and work in St. Petersburg of George Washington Whistler, the artist's father. A lieutenant in the U.S. army, "a person experienced in railroad construction”, he was invited to Russia in 1842, by order of Nicholas I, as an engineer, to supervise the construction of the railway between St. Petersburg and Moscow. 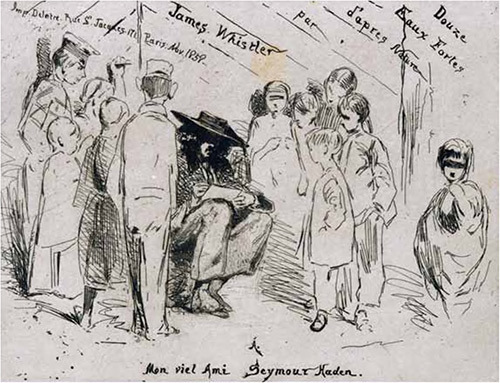 The family reunited in the fall of 1843, and starting from 1844 his son, the future European celebrity, James (Jimmy, as his relatives called him) Whistler was already taking private lessons from a student of the Imperial Academy of Fine Arts Alexander Koritsky, who worked with a construction team of the Board of Transport Routes. The subaltern Koritsky and James McNeill Whistler met working at the Board, and documents show that all members of the Whistler family, and most of all Koritsky's pupil Jimmy, were fond of Koritsky. Letters dated 1849, sent by James Whistler to St. Petersburg soon after his departure from Russia for London, are representative in this respect. Jimmy was sending his love to his mentor Koritsky, talked about art news, never doubted Koritsky saw his father often, asked about their visits together to art shows and expressed his regrets that he was far from them1. The Whistlers' house on Galernaya Street in St. Petersburg was visited by Karl Briullov, Thomas Wright and the president of the Royal Scottish Academy William Allen, who, having seen Jimmy's pictures, remarked on the young man's "singular talent”. In April 1845, according to the journal of Whistler's mother, Anna Matilda, Jimmy started to attend the Academy of Fine Arts in St. Petersburg; experienced art teachers such as Ivan Vistelius and Ivan Voinov are mentioned as his tutors. Jimmy's first visit to an Academy show in 1846 became a memorable event2, and Whistler's mother mentions that he became acquainted with many artists showing there. Among the pieces that he saw, James singled out a portrait of a young man resembling him strongly in appearance (he was probably talking about the "Portrait of a Young Man” by Pyotr Zakharov-Chechenets), but what impressed him most were landscapes and marine works, of which many were displayed, as well as sketches for the murals of St. Isaac's Cathedral. The exhibition featured over 60 landscapes, many of which focused on the sea and the attempts to render the lights of sunset or moonlight, with the artists of the Munich school and the students of Professor Maxim Vorobyev figuring especially prominently. The seascapes by Russian and international artists, the pictures with day and night scenes by Ivan Ivanov and Alexander Ivanov, the panoramic "View of Tiflis” by Nikanor Chernetsov and the landscapes painted by the latter and his brother, Grigory Chernetsov, which were inspired by memories of their travel to Palestine and Egypt and distinguished with subdued purple-blue and fleshy colours softened by a light mist - as Whistler's art of his mature period shows, these pieces made a strong, lasting impression on his memory and artistic mind. Karl Briullov, the genius whose works were the gems of the show, was displaying a series of sketches he had made for the decoration of St. Isaac's Cathedral. The young Whistler's acquaintance with Briullov's famed "Last Day of Pompeii” was an unforgettable event: Whistler saw the picture when he studied at the Academy of Fine Arts, where it was kept until 1851. The Whistlers often talked about Briullov's personality and art, because Koritsky was one of Briullov's favourite students and most trusted assistants. At the Academy of Fine Arts Jimmy Whistler also had a chance to see some paintings by Ivan Aivazovsky, acquired by the Academy in 18383. During his time in Russia Whistler started trying his hand at painting, and Russia brought him his first memorable visual impressions, and acquaintances, which defined his whole life. "I hope, dear Father, you will not object to my choice, viz: a painter, for I wish to be one so very much ... I hope you will say 'Yes' in your next, - and that dear Mother will not object to it,” wrote James Whistler in January 1849 from London to his father, who had stayed in St. Petersburg4. So, immediately after his departure from St. Petersburg, where the family spent six eventful years, the 15-year-old youth took the well-thought-over and bold step. Russia was the influence that led him to make art his profession. The works displayed at the "Whistler and Russia” exhibition - the night and day landscapes by Vorobyev, the seascapes by Aivazovsky, the cartoons by Briullov, the pieces by the members of Briullov's workshop, and other artists, included in the 1846 Exhibition Catalogue - help to partly reproduce the visual fare that James Whistler saw, and to offer us a sample of the works that produced a lasting impression on the youth. The paintings and drawings featuring different neighbourhoods of St. Petersburg and its suburbs show places visited by the Whistlers. The breathtaking architecture of the "Palmyra of the North” could not have failed to leave an imprint on the youth's memory. Jimmy liked the family outings to Tsarskoe Selo and Peterhof, the palaces, and fountains, especially the Samson fountain, with its strong jets of water gushing forth from the lion's jaws and cascading along the steps and making dazzling water fireworks5! James Whistler's familiarity with Karl Briullov's masterpieces, and the works of the Russian masters of the first half of the 19th century that he already knew, was not limited to his stay in Russia. The opinions about Whistler's art prevailing among Russian artists and critics of the second half of the 19th - early 20th centuries, and the changes in these opinions, are also a most interesting subject. It is not clear when and how Whistler's art became known to Ilya Repin, who, late in the 1890s, speaking with Anna Ostroumova when she went to Paris to study, talked of Whistler as a leading European artist. 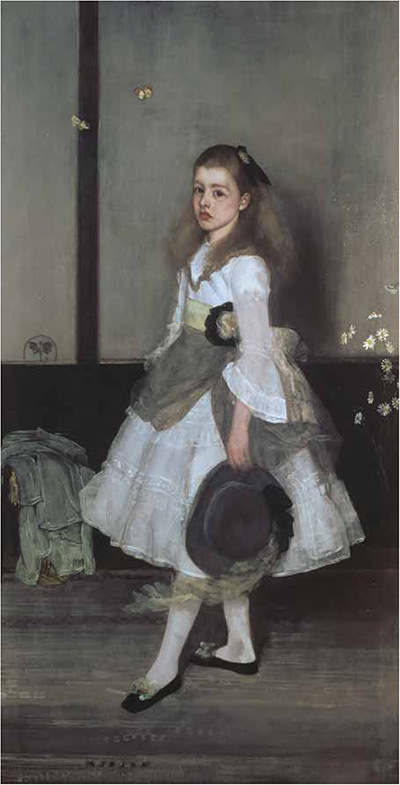 Repin may have first learned about the Anglo-American artist back in the mid-1870s in Paris, where Whistler regularly exhibited. Or he may have become interested in the artist thanks to Emile Zola, who praised Whistler in his articles as far back as 1863. Whistler and his companions were close friends with Pavel Trubetskoy, a Russian sculptor, who from the late 1890s started to show at the exhibitions of the International Society of Sculptors, Painters and Engravers, of which Whistler was elected the first president in spring 1898. 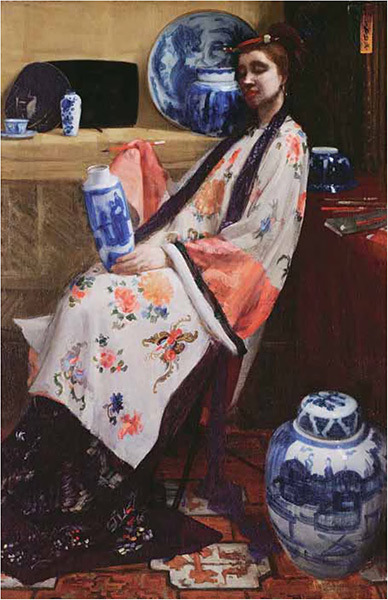 At the 1889 International Exhibition in Paris Whistler won a Gold Medal for the impressive "Portrait of Lady Archibald Campbell” and the picture "in Japanese style”, "The Balcony”. "This year the art section was overfilled,” and, not accidentally, this exhibition attracted much attention from its Russian visitors - Repin, Valentin Serov, Isaac Levitan and others. After Paris Levitan went to Italy, where he painted the picture "Mediterranean Coast” (1890, in the Tretyakov Gallery). It would be meaningful to compare this masterpiece, one of the "most accomplished and poetic seascapes not only in Russian, but in European art,” to Whistler's dainty landscapes with their elaborate colour schemes. A sense of common criteria in art inevitably brought together the Russian painters from the circle of Sergei Diaghilev and Alexander Benois, and Whistler, who was an exponent of European aestheticism. Publication of articles about Whistler, the printing of his works in Russian magazines, invitations to show at international exhibitions in Russia in the late 1890s, and the popularization of his ideas and art overlapped with the most active phase in the early period of the "Mir Iskusstva” members. Excerpts from the catalogues of collective exhibitions, controversial opinions about Whistler expressed by the artists of this group in their articles and letters seem like a live voice of the time - one which, coming in tune with the Whistlerian principles of a purely aesthetic nature and essence of art, was gradually straying away from the ideals of the artists of the "Peredvizhniki” (Wanderers) circle. For the group of aesthete-intellectuals dubbed the "Russian Whistlerians”, Whistler, who outspokenly championed "art for art's sake”, in contradiction to "damned realism”, became for a while a cult figure and even a messiah of sorts. He became the paragon of the new aesthetic ideas they preached. One cannot fail to notice the Whistlerian influences in the art of Alexei Jawlensky, Leo Bakst, Osip Braz, Konstantin Somov and other artists affiliated with this circle in the 1890s and early 1900s. 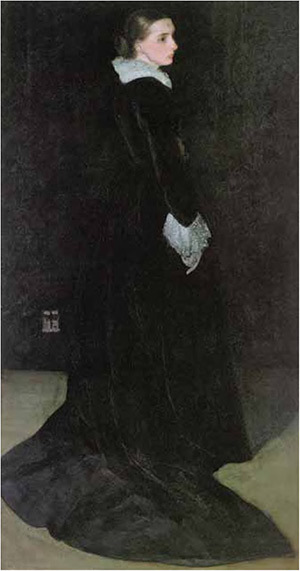 In the "Portrait of Elizaveta Martynova” (1896, in the Tretyakov Gallery), with its nearly monochrome black and grey colour scheme, Braz introduced a heraldic lily, emulating Whistler's trademark butterfly-shaped monogrammed signature. Braz's portrait, although more down-to-earth and less elegant, still evokes Whistler's portraits, like "Portrait of Mrs. Huth”. Somov was familiar with Whistler's art prior to the spring of 1897. It was at that time that he wrote to Benois about Whistler as an artist they both knew well6. Somov probably first heard the name during his travel in Europe in 1890. 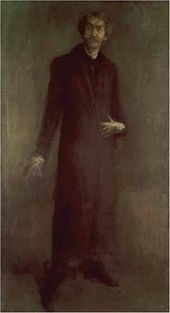 His "Portrait of Natalia Ober” (1896, Tretyakov Gallery) testifies to his familiarity with Whistler's work and aesthetic views. In France Somov began to work on his masterpiece "Lady in Blue” (1897-1900, Tretyakov Gallery). Both portraits were shown in 1903 in St. Petersburg within the framework of the acclaimed "Modern Art” project organized by Sergei Shcherbatov; in perfect agreement with the Whistlerian principles7, they were displayed under the initial, artist-given, deliberately "impersonal” titles - "Purple Dress” ("Portrait of Natalia Ober”) and "Lady in a Blue Dress”. Also at that time, Somov created several landscapes, not uninfluenced by Whistler's fireworks and falling rockets. 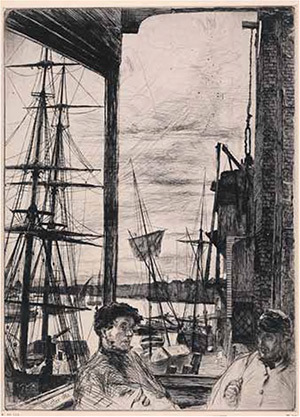 Artists affiliated with another trend in the contemporary art life of Russia - the Wanderers - also were familiar with Whistler and emulated some of his trademark techniques. Along with Ilya Repin, one can mention Emily Shanks, an artist almost forgotten, the daughter of a merchant of British descent8. 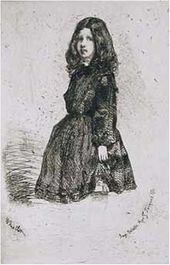 Probably Shanks became familiar with Whistler's art thanks to her ties to the British community in Russia, with which the Whistler family always remained in touch. Shanks's picture of the 1890s, "Hiring a Governess” (in the Tyumen Regional Museum of Fine Arts) has an obvious kinship with Whistler's early works, for instance, with the painting "Harmony in Green and Rose: The Music Room,” which, as Professor Margaret MacDonald kindly pointed out, from the late 1870s through the early 1890s remained in Russia, in the family of the artist's close relatives - Albert and Julia Revillon. The "Whistler and Russia” exhibition offers an ample display of Whistler's portraiture, including his world famous masterpieces - "Harmony in Grey and Green: Miss Cicely Alexander” (1872-1874) and "Arrangement in Grey and Black No. 2: Portrait of Thomas Carlyle” (1872-1873). Later, Whistler preferred for his portraits the most difficult format of a narrow, elongated rectangle and the exquisite juxtaposition of black, grey, white or subdued, soft colours. This is the style of his "Brown and Gold (Self-portrait)” (1895-1900), "Harmony in Brown: The Felt Hat” (1898), "Arrangement in Black, No. 3: Sir Henry Irving as Philip II of Spain” (1876) and other works. To highlight the similarities, the exhibition displays the works of Ilya Repin, who knew and appreciated Whistler's art - some of the Repin's pieces displayed have a stylistic closeness to Whistler - as well as the works of Serov and others masters. One of the most significant artistic events at the turn of the century was the 1900 International Exhibition in Paris. It became a triumph of Russian art and also confirmed Whistler's international reputation - this time he was showing in the American section. Repin was invited to sit on the international panel of judges. The Russian participants included Isaac Levitan, Andrei Ryabushkin, Valentin Serov, Nikolai Dubovskoi, Feodor Malyavin and others. The Grand-Prix - the highest honour - was awarded to Valentin Serov, Konstantin Korovin, and Whistler. The organizers of the "Whistler and Russia” exhibition tried to find out when and where the Russian artists may have become acquainted with Whistler's night scenes and seascapes and, respectively, what Whistler could have known about the achievements of Russian artists in this area. The exhibition features works by those landscape masters (including Korovin, Levitan, and Konstantin Pervukhin) whose favourite themes and, on a larger scale, artistic methods were in one way or another close to the foreign master's conceptions. Interestingly, many principles of Whistler's artistic tactics - for instance, certain patterns of "simplifying” forms, lighting and colouring effects - have a resemblance to the artistic experiments of Arkhip Kuindzhi, the most famous student of Aivazovsky. Kuindzhi the "magician”'s most startling "stunts” include application of a certain painterly "pull” - a coloured lighting, which sets the tone for his paintings. As for Aivazovsky's works, Whistler would have seen them when he showed at or visited as a viewer the international art shows at the International Exhibitions and Salons in Paris and London. It remains yet to be discovered whether Whistler visited the Russian master's solo shows in Paris (in 1887) and London (in 1881, 1894 and 1898). Interestingly, Kuindzhi's landscapes were shown at the 1878 Paris International Exhibition, where Whistler designed the art stand together with the architect Edward Godwin. 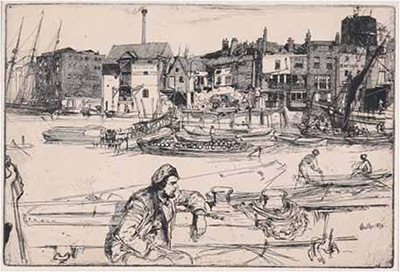 Whistler is known as a superb etcher and lithographer. Some experts believe that Whistler the graphic artist is superior to Whistler the painter, if not in originality, then in the level of craftsmanship. 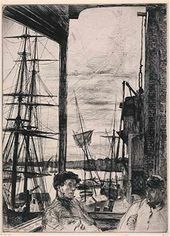 The selection of Whistler's etchings, lithographs, watercolours, pastels and drawings is distinguished for their high quality and variety: the early French set, with an obvious "Rembrandt touch”, the pictures of Venice, full of air and space, the blue-bloodedly expressive images of the Thames, the lively genre sketches and elegant decoration pieces. For several years Whistler taught at the so-called Academie Carmen in Paris - a private studio run by his former model. He was adored by American female students, who made up the majority of the student body. The only Russian student, Anna Ostroumova, came in 1898 to polish her skills under the master's tutelage. She wrote expansively about her days at the Academie Carmen, about Whistler's advice and guidance. Following her own talent, keen eye, impeccable taste and intuition, Ostroumova assimilated and processed in her distinctive way the lessons she received, becoming fully aware of her tutor's rare and superb gift in graphic art. At that period Russia, following Europe, was living through a stage of admiration for Oriental art, which was reaching Russia via the West, with France and England the trend-setters of this fashion. In the art of Whistler, who lived between Paris and London, this passion became an accomplished aesthetic concept and acquired a refined polish. Inevitably, Whistler's Russian contemporaries were all affected by this trend. A touch of the Oriental influences is variously present in pieces by Viktor Borisov-Musatov, nicknamed "the Japanese”, in paintings by Pyotr Utkin, Alexader Savinov, Fyodor Botkin and Andrei Ryabushkin, in graphic pieces by Anna Ostroumova, Vadim Falileev, and Maximilian Voloshin. For the Russian artists the Orient proved to be not so much "a delicate matter” (rather better stated, a matter of refinement), but, a complex and multifaceted phenomenon - this is reflected in a small but stylistically diverse section of the "Whistler and Russia” show, "Japanism in the art of Whistler and his Russian contemporaries”. 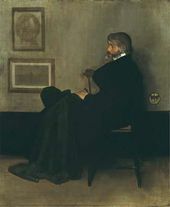 Whistler during his lifetime achieved recognition for his original tactics in art - free of didactic narration, smoothly flowing, harmonized, with elaborate colour schemes. Whistler had to defend publicly his rightness as an innovative artist at a highly-publicized sensational trial in 1878, when he sued John Ruskin, who published a vehemently critical assessment of his work. The critic charged that the artist, "a coxcomb”, dared to "ask 200 guineas for flinging a pot of paint in the public's face”. Whistler defended himself brilliantly, intelligently, and not without a sense of humour. At the justice's question, ". 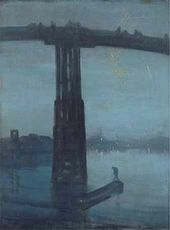 how long did it take you to concoct this nocturne?” - Whistler honestly said, ".I was working two days”. The judge was indignant: "What, two days! So you ask 200 guineas for a two-day work?”, to which Whistler retorted, "No, for all the knowledge I acquired in my lifetime.”10 The outcome of the trial disappointed both parties: the perplexed jurors reached a split verdict - in favour of Whistler as a complainant, but awarding him two pennies - two English coins of the smallest denomination - by way of compensation for moral damage! Whistler generated innovative ideas in the fields of book design, interior decor and exhibition design. As far back as 1970, Yekaterina Nekrasova, one of the first Russian scholars of Whistler's art, expressed regret that "to this day Whistler's innovations in decorative art remain undervalued”. 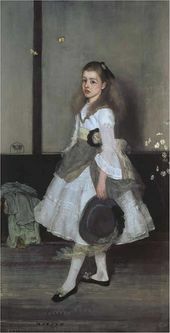 She wrote: "In contradistinction to the so-called 'coziness' of expensive bourgeois apartments of the second half of the 19th century, <...> Whistler likes light, air and prefers above all a simple, wholesome and cheap white lime wash for the walls or light, fair colours - sunny yellow, apple light-green, milk-pearly.”11. "The Gentle Art of Making Enemies” is an example of his skills in taking on art critics and detractors, an instance of the new approach to book design. The "Ten O'Clock” lecture, delivered to fine arts admirers in London, Cambridge and Oxford, the "Propositions”, addressed to professionals, are a thought-provoking amusing read, where Whistler intelligibly and without didacticism expounds his views on the mission of art. 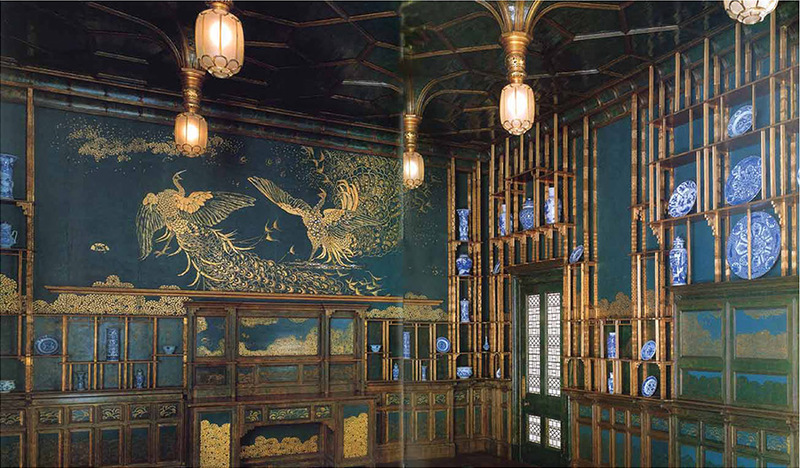 The acclaimed "Peacock Room” (1876), commissioned by the ship-owner Frederick R. Leyland, is one of the first examples of synthetic approach to decorating a private house. Whistler's solo shows, which he was organizing from the early 1880s, were revolutionary. The artist personally created the "scenario" for the openings of the exhibitions, designed costumes for the gallery attendants, and contrived ways of attracting the attention of the press. Rejecting Victorian wallpaper, and the all-over (wall-to-wall and floor-to-ceiling) pattern of displaying pictures and such, he introduced a liberal linear pattern of picture arrangement, on walls painted in colours chosen by the artist himself and matching the overall tonality of the exhibited works. Thus, he deemed brown and gold the best match for the pastels. The 1883 etchings exhibition was dominated by yellow: white walls, yellow curtains, a floor covered with yellow mats, furniture with pale-yellow upholstery. Yellow flowers in yellow pots, white and yellow liveries on the gallery attendants, yellow ties on the assistants, and Whistler himself appearing in yellow socks. Admirers and friends were given yellow butterflies. Since that time the use of yellow and white colours in interior design was called the Whistler style, although he was not the inventor of it. The elegant combination of colours is present in English Regency architecture of the 1810s-1820s, and in Russian Empire style, so brilliantly displayed in St. Petersburg. Whistler designed frames for his works in such a way as to ensure that they are an organic whole with the pictures and even, literally, "give voice” to their poetic nature. 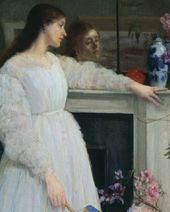 Thus, lines from a ballad by Algernon Swinburne, "Before the Mirror”, were inscribed on an elegant golden paper attached to an original frame of one of Whistler's most famous works, "Symphony in White No 2: The Little White Girl” (1864, Tate Gallery); though not an illustration to the narrative, it reinforced the spell-binding impression from the painting which inspired this poetic masterpiece. The project of Count Sergei Shcherbatov, which he started in 1903 in St. Petersburg, included the creation of a number of interior designs entirely by famous artists, and the organization of exhibitions of Japanese art and European glamour art (jewellery and luxury objects from Tiffany and Lalique). The project, titled "Modern Art,” became "our, Russian response” to the challenges posed by European trends in design and exhibition activity. The room created by Shcherbatov was decorated with a frieze patterned with peacock's feathers. 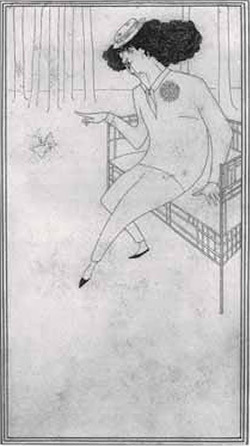 The combination of paintings and poetry, the pictures' "musical” titles, scripted art shows, and special design for the exhibition spaces - these and other of Whistler's techniques were used by artists from the "Mir Iskusstva” (World of Art) and "Golubaya Roza” (Blue Rose) movements. Whistler's principles of exhibiting high art, once seemingly daring and shocking, with the introduction of special decorative features and luxury objects into exhibition practices, and active engagement with audiences and critics, later became a norm. Designers today creatively pursue and liberally interpret the artist's principles. The variegated, direct and indirect crossings of and contacts between Whistler and Russian artists of different schools and associations in the second half of the 19th and early 20th centuries is a subject larger and more multifaceted than may appear at a first glance. The parallels, similarities in the experiments in painting and design, the closeness between the aesthetic principles in the art of Whistler and his Russian contemporaries testify to their self-sufficiency and highlight the indivisibility of the process and Russia's active role in the European art life in the second half of the 19th-early 20th centuries. Whistler's works were exhibited in Russia only rarely, for the first time in St. Petersburg at an exhibition of German and English watercolourists at the museum of the Baron Stieglitz School of Technical Drawing (in 1897) and at the First International Exhibition of the "Mir Iskusstva” (World of Art) in 1899. As correspondence between Sergei Diaghilev and Whistler shows, the organizer was trying to secure several famous works of the master, but, to his great regret, the owners did not agree to send them to Russia13. In 1958, the Pushkin Museum of Fine Arts held an exhibition of works that were initially in German museums but then relocated to the Soviet Union during World War II. The catalogue included eight etchings by Whistler - like other items, these pieces were returned by the Soviet government to East Germany. Two years later, with the British Council's support, an exhibition "British Paintings. 1700-1960” took place in Leningrad and Moscow. The show featured four of Whistler's works, shown in Russia for the first time - they included two world famous masterpieces, "Arrangement in Gray and Black No. 2: Thomas Carlyle” (1872-1873) and "Harmony in Grey and Green: Miss Cicely Alexander” (18721874). The Tretyakov Gallery and the British Council are especially grateful to Alisher Usmanov, who lent considerable support to the implementation of this outstanding international exhibition, which presents the art of James McNeill Whistler to the Russian public for the first time. Whistler on Art. Selected Letters and Writings of James McNeill Whistler. Edited with an introduction by Nigel Thorp. Manchester with the association with the Centre for Whistler Studies, University of Glasgow, 2004, P 1-3. James McNeill Whistler. The Gentle Art of Making Enemies. Preface, translation and annotations by Ye.A. Nekrasova. Moscow, 1970, Pp.31-32. Hereafter: Nekrasova. Report of the custodian of the academic museum of the Academy, about acquisition of paintings bought from Ivan Aivazovsky. Of March 14, 1838//Aivazovsky: Documents and Materials./ Compiled by M.S. Sargsyan, G.G. Arutyunyan, G.M. Shatiryan. Edited by Z.G. Bashindzhagyan. Yerevan, 1967, P 24. Quoted from. : Whistler on Art..., P 3. Quoted from: Nekrasova., FI 31. From a letter to Alexander Benois, early March 1897 [about the exhibition of English and German watercolourists]: "Whistler is the cheekiest fellow, he sent in rough sketches, which he's selling for hundreds. What he calls a portrait is two or three daubs in soft-tones, that's all. True, these daubs are zestful." Konstantin Andreevich Somov. Letters. Journals. His Contemporaries' Opinions. Moscow: Iskusstvo, 1979, p.58. Catalogue of the exhibition of paintings, sketches and drawings by Konstantin Somov. Salon "Modern Art." St. Petersburg, 1903. № 45, № 3. For more information about Emily Yakovlevna Shanks (1857-1936), see: O.A. Leikind, K.V Makhrov, D.Ya. Severukhina. Russian artists living outside Russia. Biographical dictionary. St. Petersburg: Notabene, 1999. p. 615. Quoted from: Jacques de Langlade. Oscar Wilde. Moscow, 2006, P 50. Letter from Sergei Diaghilev to Whistler [December 1898], Glasgow University Library, MS Whistler D46; GUW 00840 - kindly pointed out by Professor Margaret MacDonald. Pen and black ink on wove paper. 21.1 by 11.8 cm. RosenwaId collection, National Gallery of Art, Washington, D.C.
Etching. 11.8 by 7.9 cm. Pushkin Museum of Fine Arts, Moscow. Annie Harriet Haden (1 848-1 937) was the oldest daughter of Francis Seymour Haden and Whistler' sister Deborah. She posed for Whistler many times, including the painting "Harmony in Green and Rose: The Music Room"